Learn : comparison of working stress method and limit state method, working stress method,Drawbacks of the working stress method, Limit state method : Limit state of collapse, Limit state of serviceability. This method of design was the oldest one. It is based on the elastic theory and assumes that both steel and concrete and elastic and obey Hook’s law. It means that the stress is directly proportional to strain up to the point of collapse. Based on the elastic theory, and assuming that the bond between steel and concrete is perfect, permissible stresses of the materials are obtained. The basis of this method is that the permissible stresses are not exceeded any where in the structure when it is subjected to worst combination of working loads. 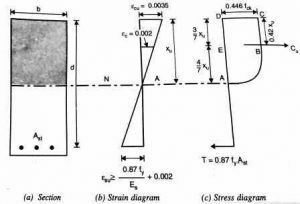 In this method, the ultimate strength of concrete and yield strength or 0.2% proof stress of steel are divided by factors of safety to obtain permissible stresses. These factors of safety take into account the uncertainties in manufacturing of these materials. As per IS 456, a factor of safety of 3 is to be used for bending compressive stresses in concrete and 1.78 for yield/proof strength of steel. (i) It assumes that concrete is elastic which is not true as the concrete behaves inelastically even on low level of stresses. (ii) It uses factors of safety for stresses only and not for loads. Hence, this method does not give true margin of safety with respect to loads because we do not know the failure load. (iii) It does not use any factor of safety with respect to loads. It means, there is no provision for the uncertainties associated with the estimation of loads. (iv) It does not account for shrinkage and creep which are time dependent and plastic in nature. (v) This method gives uneconomical sections. (vi) It pays no attention to the conditions that arise at the time of collapse. The working stress method is very simple and reliable but as per IS 456:2000 the working stress method is to be used only if it is not possible to use limit state method of design. Working stress method is the basic method and its knowledge is essential for understanding the concepts of design. (ii) Limit state of serviceability. (a) Limit state of collapse : Flexure. (b) Limit state of collapse : Shear and bond. (c) Limit State of collapse : Torsion. (d) Limit state of collapse : Compression. (a) Limit state of deflection. (c) Limit state of vibration. This method is based upon the probabilities variation in the loads and material properties. 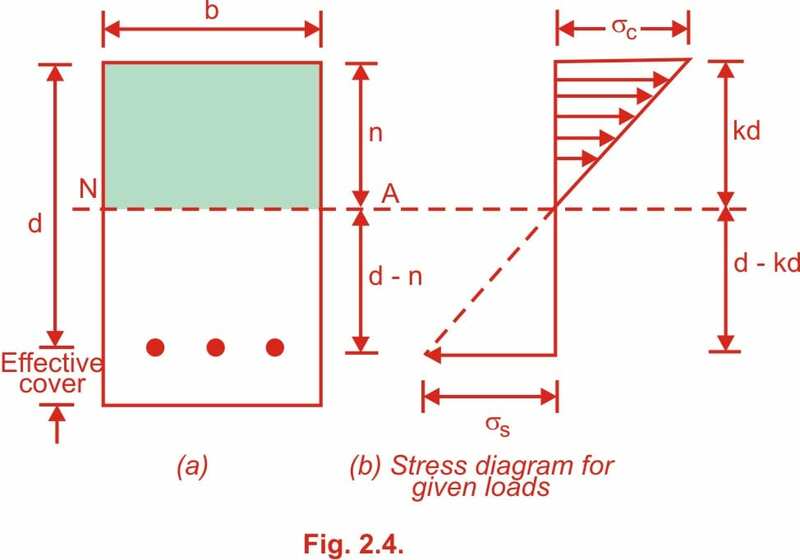 Limit state method takes into account the uncertainties associated with loads and material properties, thus uses partial factors of safety to obtain design loads and design stresses. 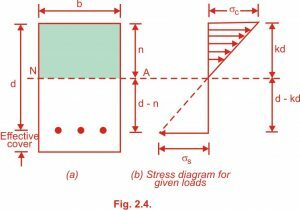 The limit state method is based on predictions unlike working stress method which is deterministic in nature, assumes that the loads, factors of safety and material stresses are known accurately. In the limit state method, the partial safety factors are derived using probability and statistics and are different for different load combinations, hence giving a more rational and scientific design procedure. 1. This method is based on the elastic theory which assumes that concrete and steel are elastic and the stress strain curve is linear for both. This method is based on the actual stress-strain curves of steel and concrete. For concrete the stress-strain curve is non-linear. 2. In this method the factor of safety are applied to the yield stresses to get permissible stresses. In this method, partial safety factors are applied to get design values of stresses. 3. No factor of safety is used for loads. Design loads are obtained by multiplying partial safety factors of load to the working loads. 4. Exact margin of safety is not known. Exact margin of safety is known. 5. This method gives thicker, sections, so less economical. This method is more economical as it gives thinner sections. 6. This method assumes that the actual loads, permissible stresses and factors of safety are known. So it is called as deterministic method. This method is based upon the probabilistic approach which depends upon the actual data or experience, hence it is called as non-deterministic method. It is very good notes.easily undustued.